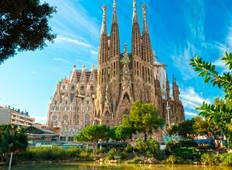 Find a Christmas & New Year trip that explores Spain. There are 114 tours to choose from, that range in length from 3 days up to 17 days. The most popular month for these tours is December, which has the most tour departures. "This was one of the best tours we have been on. Real value for the money. It have..."
"The tour and all we learned was outstanding. We would have appreciated more shared..."
"Jeanette was a fantastic tour guide who made sure everything went as smooth as possible...."